Two new mebers, Ghastly and Link talking about how gay the site and everyone on it was for telling them not to judge people based on their interests. Excellent modding as always, Spleen. Thank you. You have emo to think for hiding the thread while I was sleeping though. Am I not the only one convinced they were, like, 10? They also both had unnatural fixations on Nintendo characters. I don't know why this makes me laugh so hard. I think it's the thought as Kim Sung as a poster on the internet. I admittedly have a small obsession with North Korea and dystopia. Funnily enough, I'm watching a documentary on the country as I type. So are they banned then? Because if they aren't this shouldn't quite be a public thread I don't think. It's hard to tell, the average people the reporter speaks too are only allowed to speak off a memorised script. The defectors are very nice though, they give a great perspective. I am on the same page as you on that one. They were definitely rough around the edges in a very typical way for small children. It is not ok to insult other members. that's a paddlin. It is not ok to insult a race. that's a paddlin. It is not ok to insult a sexual orientation. that's a paddlin. It is not ok to hate someone because they are different than you. 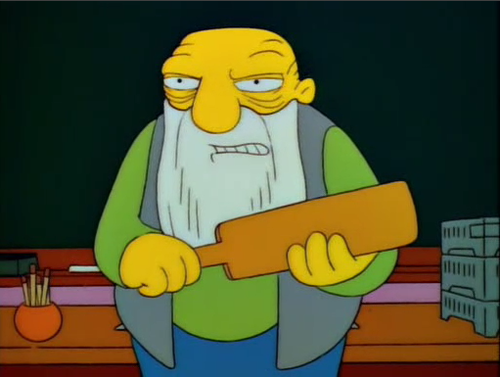 oh, you best believe that's a paddlin. I love that episode, and most things Jasper does. Haha, I should have done the paddling thing. Not everyone views a paddling as a bad thing. Good on you Spleen for banning them. Even before the topic, I found them quite annoying to be posting random gifs and images, not contributing to any conversation anyway.